Trusted ink cartridge recycling fundraiser. How does a recycling fundraiser work? How should I tell people? You can promote your recycling fundraiser by telling people exactly what it is. We pay you cash for your empty inkjet cartridges -- that’s it. We aren’t trying to make ink recycling complicated, and that is why our site is so easy to use. Try it out for yourself, and setup an recycling account today. See how easy InkRecycling.org makes it to raise money through an ink recycling fundraiser. How do I keep track of my empty cartridges? 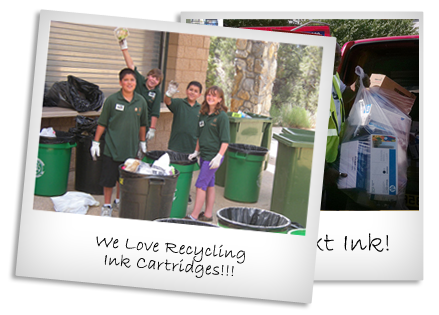 We suggest that you go in and place a recycling order every time you receive any inkjets. Running a successful ink recycling fundraiser is easy using our website. Ink Recycling allows you log in and update your order before you place it. Feel free to login 24/7 and check your account for order status updates. InkRecycling.org wants to make you to feel comfortable that you will be able to organize your inkjets simply and efficiently. When and how often do you get paid? What could be easier than a fundraiser you could use forever? InkRecycling.org provides you with the flexibility of placing an order at any time. Start your next fundraiser with us and see how much money a recycling fundraiser can earn for your school, charity or business. Never worry about how you’re going to coordinate the pizza man showing up or how much extra money you have to spend on a candy drive. Bottom line-- You will never have to worry about spending extra money on services to start your fundraiser. There is no contract either. All you have to do is collect the empty inkjet cartridges and we will recycle them for money! It’s easy to use our system for your recycling fundraiser. Over that last couple of years, InkRecycling.org has helped hundreds of schools raise money for their causes. Earn money to help pay for school field trips or school dances. This is the best way to have some extra money to pay for supplies to pass along to the kids. The most effective way to raise a lot of money is to start collecting cartridges early in the school year. The more empty inkjets that you accumulate, the more money you will raise for your school!